Alternative title: "Mirotic". Yes, pun intended. Turns out that Pokemon trading cards have this absolutely gorgeous art, and if it wasn't for Kritty I'd have never come across with it. It's all about her Shroomish wallpaper!. I actually started this last January, but I have been so lazy and my computer was so crappy that opening the .psd file was a huge pain. But now that my pc is fast again I can properly wall again! Lastly, much thanks to Kritty for revising my wall, it was VERY helpful. Beautiful painting job there and milotic looks so badass like usual. I love Milotic a ton as it already is, and this made me love it even more <3 Beautiful work! loll does mirotic have anything to do with dbsk's mirotic? <3 <3 <3 I love Pokemon! Really nice work on the painting, I like the shading especially. Great work! Milotic always my favourite pokemon since sapphire is out. Main title should've been mirotic. I GOT CHUUU UNDER MY SKINNN~. Nice colour work, I like the way the shadows have been formed and the movement in the picture. 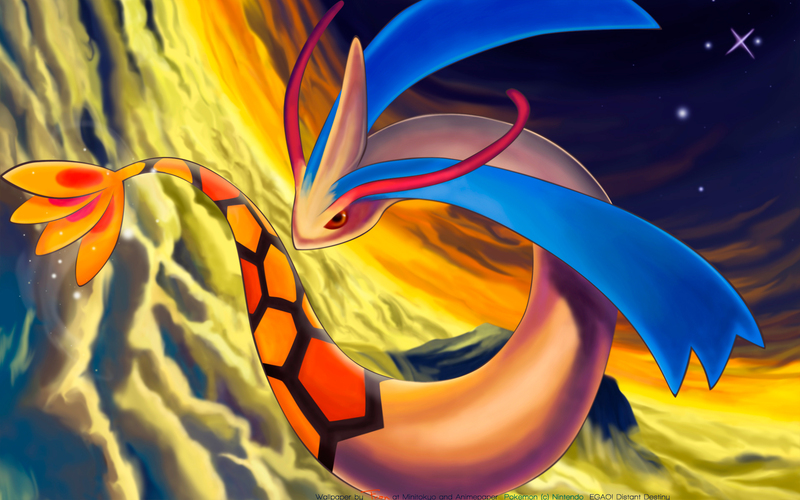 I reckon you could've gone for more contrast on milotic, and less smudgeyness to bring him into the foreground more. So happy to see this is done, the painting is very nice. is better in a painting to be a bit rough. Lovely job. Thanks a lot for making this pokemon wall, Milotic is awesome and I too still love pokemon. I love how you painted this wall. Its so pretty and colorful! Some pokemon cards do have beautiful art in them but sadly they are so small. Anywho, its a beautiful wall for the beautiful Milotic to show off in. Pokemon wall! Nice painting, (it's so different from what you usually make XD) though I think the clouds could be a bit less smudgey. It's so colourful.